Nicole is a complete disaster. We are planning on leaving tomorrow for a long day trip to Half Moon Bay. The following day being the last of this voyage as we sail back into San Francisco Bay. Emotions are heightened and my girl is a mess. Me, I don't think it has really sunk in yet. I keep feeling like it's just another tough bashing long daysail where we once again wake up before sunrise and motor-sail into the wind and seas until the sun goes back down. Just another crappy passage making miles north. It's crazy what you can get used to and this has been our routine for a long time now. I'm still hanging in there, but I'm sure I will have my breakdown soon enough. But this is really IT. We are almost there. Almost finished. DK will soon be pulling back into the barn where she started out and the journey will be complete. And, yes, we are selling DreamKeeper. We have a little work to do to clean her up and put her on the market, but that's just the reality. We just don't want to keep such a great boat sitting in a slip not being used for what she was meant for, even though it will be super hard to let her go. Hopefully someone great will buy her and take her out for another loop around the globe. She is still ready to go and nothing would make us happier. 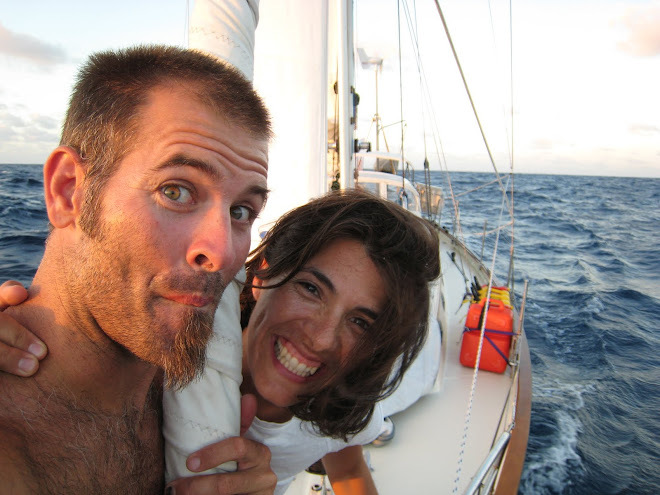 So, even though we both are going to seriously miss our boat, this adventure, and the whole journey which has been our life now for almost 5 years, we are also ready for the change. But first we have to finish it off and what better way then back under the Golden Gate Bridge, in our opinion the coolest bridge you can ever ever sail under. It will be a crazy reality. Currently we are in Monterey Bay. This place is just sweet. Yes, it is full on tourist season, but all for a reason. It is a great town with a beautiful marine environment setting. I mean...where else in the world are you greeted by 4 sea otters floating on their backs pounding clams on their bellies for breakfast when you slip through the fog and enter the breakwater to the marina? And not only sea otters, but California sea-lions and harbor seals run this place. They haul out on anything and everything possible and claim it for their own. And, last but not least, the water here is almost crystal clear, and this in northern California. As you can probably guess, we've been to quite a few marinas around the world, and we can honestly say that this one has the cleanest water we have seen. You should come. You won't be disappointed. Backing up a bit...after Nicole wrote the last blog at the Coho Anchorage before Pt.Conception, we had a little shut-eye and were hoping for a mellow night with the winds laying down and us motoring around the two windy points at 2 in the morning. But, of course, we should have known better. At 1 a.m. we both woke with the wind whistling and the boat pounding through the wind fetch. I peeked outside and looked at the compass and wind instrument....what the??? the wind was blowing 25+ from the EAST and we were getting pulled back close to the kelp bed and the lee shore, where two sailboat carcasses were high and dry on the rocks. It felt like we were in a bad movie, the fog was so cold and thick that we couldn't see more then a couple of boat lengths away and the waves were starting to break over our bow. What a fun way to wake up. We dressed in all our layers muy rapido and went into auto-pilot "time to deal mode". Within 15 minutes we had the hook up and were beating into the gusting winds and seas until we could safely raise our main, turn downwind and actually SAIL?!! Yes, there was something positive that was happening...with a reefed mainsail and my eyes glued to the chartplotter and radar screen, my only perspectives in the thick fog and black night, we sailed around Pt. Conception and Pt. Arguello. And then, a couple of hours later, the wind completely died and we were back to motoring. And that's what we did for the next day and a half, motor through the fog. The only highlight being surrounded by a pod of 15-20 whales, type unknown. Once again another special marine mammal experience. One last dinner in town, one last warm shower, and we are bedding down for a super early morning departure. The weather isn't looking great, but could be worse, and we are hoping to make decent miles to arrive in Half Moon Bay before sunset. Wish us luck and thanks again for all the love from our fans! Welcome (almost) home! You guys are great, thanks for all the updates. Sorry your circumnavigation didn't end on a higher note and although it is understandable, it is sad to hear you are selling Dreamkeeper; the "most uncomfortable" last leg passage does leave a bittersweet taste although endings and goodbyes are never easy. I suspect that once ashore, the reflection on the journey in totality will be fonder and the recent challenges of pounding in chilly weather toward home will be push aside? I'm sad to watch your trip coming to an end, but do hope you keep us informed as to what life ashore brings. Good luck with selling Dreamkeeper ... I hope the market for boats is on the improve? as a follower of your blog, I hope everything is allright. it's been a while since posting and and I'm sure I'm not the only one wondering how things are.